Title: Training Somali community health workers to deliver the LLTTF classes, showed significant improvement in attendee’s self-assessment of mood. Project: To test the feasibility and acceptability of implementing an evidence-based, peer delivered mental health intervention for Somali women in Minnesota, and to assess the impact of the intervention on the mental health of those who received the training. Target group: Somali born women living Minnesota who wished to attend a program to build positive mental health, felt that they would benefit from the course and were 18 years of age or older. Setting: Minnesota (USA) – Somali community. Intervention: 11 Somali women were recruited to be trainers in the CBT based Living Life to the Full classes. The trainers underwent 3 days of training with a consult from the Five Areas Team. The 8 sessions of the LLTTF class (slides and trainer speaker notes) were translated into Somali. 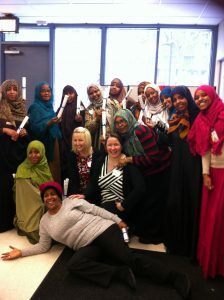 Support offered: 55 Somali women were enrolled into the study and all participated in the full 8-session LLTTF program. Outcomes: Self-assessed measures of mood were collected from study participants throughout the intervention and focus groups were conducted. The 55 Somali women who participated recorded significant improvement in mood, with self-reported decreased in anxiety and increased in happiness. Focus group data showed the intervention was well received, particularly because it was delivered by a fellow community member. Participants reported gaining skills in problem solving, stress reduction and anger management. Participants also felt that the intervention helped to address some of the stigma around mental health in their community. What else? Delivery of CBT by a community health worker offered an acceptable way to build positive mental health in the Somali community.